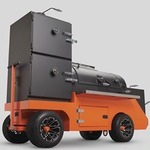 Yoder Smokers Community Forum • View topic - New 640 owner and love it. New 640 owner and love it. Did my first cooks on my new 640, chicken one day salmon tonight. Loved it. Look forward to reading all the good info on the forum. Have already learned some interesting stuff. Re: New 640 owner and love it.